Delicious Monster is a two-person company out of Seattle with a good pedigree in the Apple development community—even though half the company is eighteen years old, he’s been writing good software for the past three years. They have just released Delicious Library, a cataloguing application for books, music, movies and computer games. John Siracusa has a detailed review at Ars Technica. As Siracusa points out, an application designed to keep a catalog of your books and whatnot is fundamentally a boring idea. Yet Delicious Monster has managed to make it cool. They do this by cleverly taking full advantage of the capabilities of the Mac OS and Amazon’s Web API. 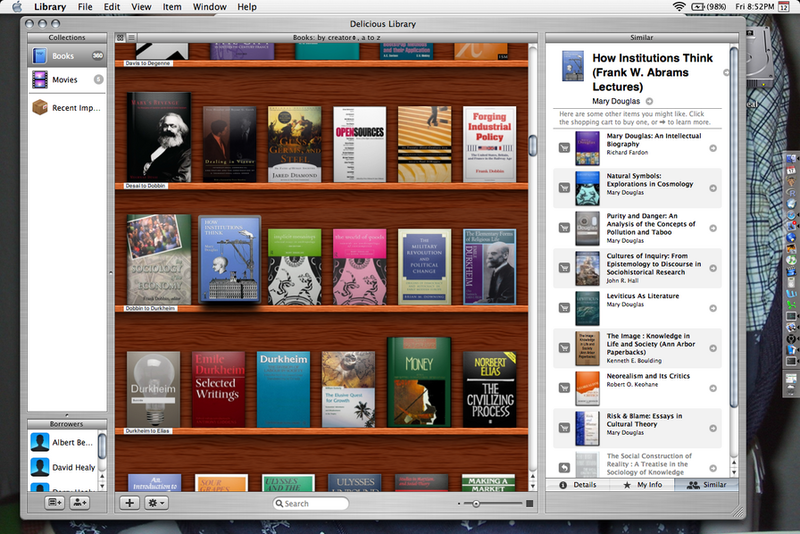 If you (like me) have an iSight Camera then Delicious Library can turn it into a barcode scanner. You scan the code, Delicious Library looks it up on Amazon, downloads all the details available for it (including a summary and the cover art) and the item is added to your shelf. It can also point you to similar items on Amazon, and if you happen to own them you can just drag them over to your shelf. The result is that you can build a pretty big database really fast, because there’s no typing involved. The result looks like this. It’s like creating an iPhoto or iTunes library on the fly for the books on your shelf. It’s absurdly satisfying to use, even though it’s basically useless in its current form. I mean that you can’t actually do anything very much with the data besides sort it every which way and print it out nicely. Well, that’s not entirely fair. You can sell the items you own on Amazon. And you can keep track of any books you loan out to people. But that’s about it right now. I imagine there are a lot of obsessive geeks out there who just want a catalog of their stuff, of course, and some people may well have a collection worth cataloguing for its own sake. What I really want from future versions is the ability to (a) output nicely formatted web pages (or PDF files) with selected books and any annotations I want to add, and more importantly (b) output data to a BibTeX file (or Endnote for the great unwashed), preserving annotations and ISBNs, etc. That would make it really useful. There’s a free application called Books that can do some of those things. Combining that functionality with DL’s eye-candy and iSight-scanning would turn it into a really killer application. fn1. This is pretty useful, actually, because graduate students love to borrow books and never return them. DL puts a little yellow “Out” stripe over the corner of books you’ve loaned out, keeps a shelf of loaner books for everyone you lend to, and puts a reminder in your calendar to go get them back. The review is more a riff on the “climate of excellence” that Mac users — and developers — have built around their platform. Siracusa hammers his point home again and again that what Apple offers in those comparatively overpriced boxes is a first-class experience. Not to start a flame war: if you want to go that route, I suggest you read the review Kieran links to and take it up with Siracusa. It will be interesting to see what becomes of this: I’m thinking the iSight moves up my purchase list as a result of this. And since I purchased a book this year that I was *sure* I had loaned to someone, perhaps I need this before I waste any more money (as if money spent on books could be called wasted). Seriously, though, it sounds pretty cool. If only it would tell me where the goddamn book is in my house right now. What I’d like for them to do is let you search the printed indexes of all your books. Users could scan in the indexes of their books, OCR them, and submit the information to the company’s server, similar to submitting track info to CDDB. When you scan in a barcode for a book, instead of just getting the publication data and cover image, you could download a chunk of data encapsulating that book’s printed index. Then, you could search for a term, and the program would display any index entries it appears in, from any of your books. It wouldn’t be full-text search, but it’d still be pretty useful, I should think. And much less work to implement than full-text, and less fraught with IP tripfalls. As someone who once earned quite a nice living cataloging books for libraries, I mildly resent the suggestion such work is obsessive geekery. I’d love to have our collection cataloged because we end with far too many dups. Of course, this assumes keeping the catalog updated, but as an obsessive geek I don’t find this particularly daunting. Though I imagine that most PC users will find that review completely insufferable, it’s probably the most concise explanation of why I have always been and will always be a Mac nerd. Sounds kind of cool except a majority of the stuff I would want to catalog is sans bar code. Well… looking at my bookcase I realize probably a slim majority of the books do have barcodes on them; but the ones central to my “collection”, the books dearest to my heart, are almost universally lacking one. Not really an issue for Windows-using me anyways. I have been wanting sell off a good part of my library (just because I am sick of having all this stuff around) and this set-up might be just the thing to enable a mass posting/pricing on eBay. Why on earth would anyone want an in-computer catalog of all the books he/she owns? I mean, I’m sure some people do want such a thing. But for what purpose? Well, I think my post basically acknowledged that there _are_ people of the first sort (cf Mary Kay), said that I’m not quite one of them, and suggested a few extensions to DL that would put that catalog to work in different ways. Siracusa’s review has a bunch of suggestions, too. Is this as Amazon-dependent as it seems? because not only is Amazon pretty useless for anything too old or obscure to have an ISBN, but I’ve found (while trying out Books) that Amazon’s info for current ISBNs isn’t nearly as good as that of the LoC, or OCLC (whichever the other default Books suggests is). Amazon has many errors in basic bibliographic info, and is just awful at subject heads and subheads. That is, their backend seems quite good at it, but not the data they exported. The benefit of having a database of one’s books, IMO, is to be able to search by their several subjects, instead of wondering if a book on the history of British X is shelved with history, or British, or X, or funny-sized books. Later I want to have Friend-Of-A-Friend catalogs so I can find out if anyone who gives me lending privs has a book. Oh, and of course exporting to a bibliographic program would be good, and a catalog also should keep track of digital resources (.pdf files of research papers, or RFCs, or literate code, or so forth) and my comments on them, so that I don’t need to know what format I have information in, I can search for the information. Indexes happen to be copyrightable independent of the work they index, so while jon h’s idea is excellent, I don’t think it’s free of IP tripfalls. Wouldn’t it also be useful for cataloguing for insurance purposes? As a movie junkie, I’d like to know I could get full value for my out of print Criterion DVDs if I can show my insurance company I had them in case of fire and what not. Heavens, what are you doing on an academic blog? Books = the universal good. She who dies with the most books wins. Buy books, not food. Toy that allows you play with your books = joy. This is *cool* — so cool, in fact, that it may even get me to switch. Except Mac doesn’t support Wordperfect, and everything I’ve written is in that format. Including my just-about-ready-for-the-publisher manuscript, which I do not want to reformat. I’ve used a similar program– Readerware– on my PC for the past couple of years, (available at readerware.org). It might not be quite as cute as this one, but it seems to have most of the same features. The bar code scanning I do with the free cue cat (some of which are still floating around out there, I believe). It also gets information from Amazon (and you can export your entire Amazon purchase history into the db in one fell swoop), but it also looks up book info from other online booksellers and the Library of Congress. I can also send the database PDA, so I always have a catalog of my books with me (which actually comes in handy more than you might think, at least for those of us with way too many books). (the PDA functionality is less robust than the program overall, though). The software helps satisfy some of my geeky need to index and catalog (and my unhealthy obsession w acquiring more books) , but I too have wished that I could do more with the software, integrating it with Endnote capabilities, etc. Still, though, I’m happy that I have it.